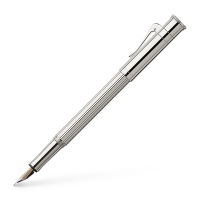 Graf von Faber Castell Classic fountain pen with platinum plated barrel, finely ribbed, and platinized fittings. Hand-made bicoloured 18-carat gold nib with iridium tip, "run in" by hand. Well engineered mechanisms and robust details, such as the spring-loaded clip made of solid metal, ensure that the joy of using them is as timeless as the design. The platinum plating creates a very hard and resistant surface that does not oxidise.